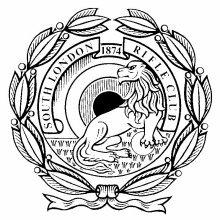 The South London Rifle Club was founded in 1874 at Nunhead in South London. The club moved to Staines in 1892 and then to our current location at Bisley in 1923. Since its foundation the club has encouraged target shooting with rifle and later pistol. Our members take part in many of the competitions at Bisley as well as those we organise ourselves. The club is particularly active in promoting target shooting amongst young people such as scouts and cadets. Our members have full use of our clubhouse at Bisley, which is to the rear of Fulton’s gunshop and opposite the road to the NRA Range Office. The clubhouse has a kitchen, lounge and dining areas, sleeping accommodation and a gunroom for cleaning guns. The club is a registered charity, number 231229.